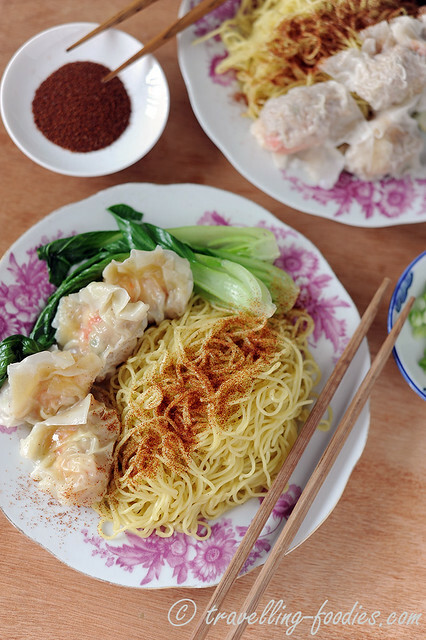 港式鮮蝦雲吞蝦籽撈麵 Shrimp Dumplings with Shrimp Roe Noodles is a must-eat for me whenever we visit Hong Kong. My usual joint would be Lau Sum Kee 劉森記 at Sham Shui Po, together with his uber yummy braised beef brisket, not forgetting the wonderfully braised pig trotters… My oh my, I can feel my salivary glands churning up some juices already as I recollect my dining experiences there when I pen this. Incidentally, here is also one of the few places in Hong Kong where one can still find traditional egg noodles known locally as 竹昇麵 zhuk sang meen, whose dough is manually compressed and plied using a thick bamboo pole with someone applying his own weight by sitting on it. We’d eaten shrimp dumpling noodles umpteen times over our countless trips to Hong Kong from the earliest ones more than a decade ago to popular tourist traps like 池記 and 沾仔記，to the other more local joints like 麥文記， 麥奀雲吞麵世家 and 何洪記, not to mention the very many “nameless” stalls all over the territory. Oddly, I’d never mustered enough courage to try and make it my own, probably because after eating the noodles at so many joints, we’d somewhat formulated our own benchmark of what good shrimp dumplings should taste like, seemingly unattainable by my then-understanding of the ingredients for making it. But after observing the workers prepare the filling and wrap the dumplings right before our eyes during our numerous visits to these noodles shops found all over Hong Kong, chatting up with some of the cooks with my impoverish Cantonese trying to steal a trick or two in the process, and of course, reading up some credible recipes from various blogs and books, I think I’m ready to give it a shot. So here’s my rendition of the dried form of the ever-popular 港式鮮蝦雲吞蝦籽撈麵 Shrimp Dumplings with Shrimp Roe Noodles. So effortless and easy to eat, but so many ingredients are incorporated into the making of the dumplings alone. That is most definitely so for the Hong Kong version as the dumplings themselves are packed with so much flavour, the noodles are hardly seasoned at all, unlike the “black” versions we get over here in Singapore and Malaysia, with soya sauce, chili and whatnots added. That said, a little effort really goes a long way, so try not to find alternatives and most definitely do not try to scrimp on the ingredients or take shortcuts for processes involved as well. The base of the dumplings is made from a mixture of minced shrimp and minced pork. There are shops in Hong Kong who do all-shrimp versions for their wantan dumplings, which means higher costs and also high caloric levels! Many however, go by a pork and shrimp combo filling but the minced pork used has a “半肥半瘦” 1:1 fat to meat ratio. This means 50% of the pork used is lard, which can be very daunting for some folks naturally, not realising that they really have the fat in the dumpling to thank for, to achieve that much coveted “succulent and juicy”textures. The minced shrimp is “processed” simply by slapping each shrimp hard onto a large wooden chopping board with the side of a chinese cleaver. For the minced pork, one can use a nice piece of fatty belly meat and request the butcher to remove the rind before grinding it down. Part of the shrimp used are kept intact so that the dumplings would have more ” bite”, adding textural contrast with each morsel. In the past, the shrimps were often made more succulent by adding borax, otherwise known as 硼砂. But this is hardly used anymore as it is a controlled poison here in Singapore. What can be done to give the shrimp that uber chewy and springy textures however, is to add egg white into the marinade. A little baking soda can also be added if it helps but as always, use the freshest shrimp available. A must-have in Cantonese shrimp dumplings is dried sole (扁鱼) or better known to the Hong Kong locals as 大地鱼 dai dei yue. This can be easily obtained from shops that deal with dried goods aka 南北货. 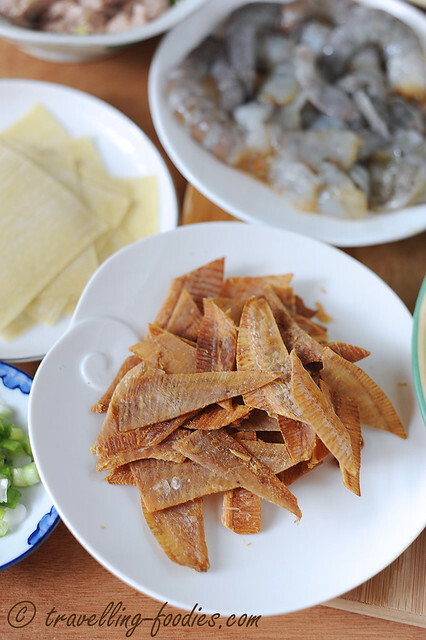 Dried sole is commonly used as an important ingredient for the soup base. There are several forms which are available. One is the entire sole fish intact, then there is a type where the fish is carefully “halved” with one side holding the skeletal system i.e. bones, tail, fins etc while the other side has only half of the dried flesh left. 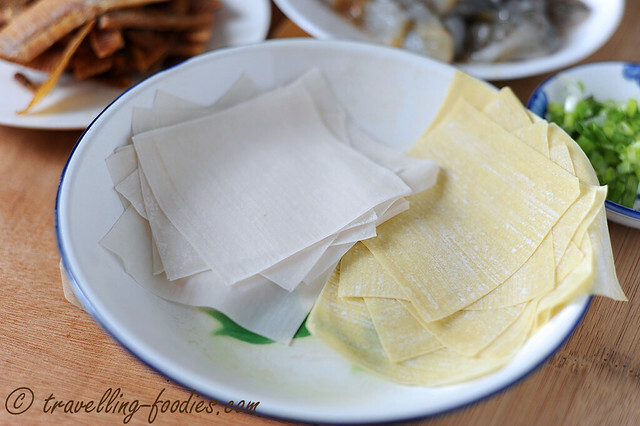 For the ones used for wrapping shrimp dumplings, the last type without any bones is used. If this processed version is not available, simply “debone” the flesh yourself and save the bones for soup. The flesh is then toasted briefly until crisp and fragrant, before being ground into a powder. So good as a condiment in cooking porridge, or even seafood stir fry as well, for the lovely aroma and umami flavours it is bursting with. There are a few types of wantan skin available in the supermarkets. One of which is yellow, as egg is added into the dough for its making while the other is white, without egg of course. Those used in the Cantonese style shrimp dumplings are all of the former with the white version largely used for other dumpling versions like ”馄饨“ or “扁食”. If the yellow egg version is not available, the white ones would be an acceptable substitute. Whenever possible, use fresh yellow egg noodles. This is commonly available in the supermarkets, wet market stalls and some food supplies shops in Singapore and Malaysia. In other non-Asian places, they may be available at the Asian grocers in your nearest Chinatown. However, one who has tasted Cantonese style egg noodles would be quick to realise that the texture is remarkably different despite the similar facade. In Hong Kong, the traditional way of making egg noodles involve the use of very few ingredients with duck eggs being the star, relying only on the moisture from the eggs, very little or no water is added. The intense colouration of the noodles comes from the yolks, not to forget the unmistakable eggy aroma, preserved beautifully when the noodles are blanched all so briefly so that they remain extremely springy and chewy, one of the features which characterises good egg noodles. Nowadays, egg noodles are often added with ammonium salts to recreate those springy textures, which however leaves a sometimes overpowering odour from the ammonia gas liberated. If fresh noodles are not available, dried ones can be used of course but go for a variety with eggs added. The cooking time would of course defer slightly so just follow the instructions on the packaging. The star of this dish is of course 虾籽 har zee which is essentially dried shrimp roe, not unlike ebiko in Japanese sushi but these used in Cantonese cuisine had been dehydrated with all the flavours intensified and locked into each microscopic grain. I first bought har zee from Lau Sum Kee Noodle Shop where I had a taste of it for the very first time many years back. 2 years ago, we chanced upon this packaged form available at the local supermarkets in Hong Kong and it was like striking jackpot. 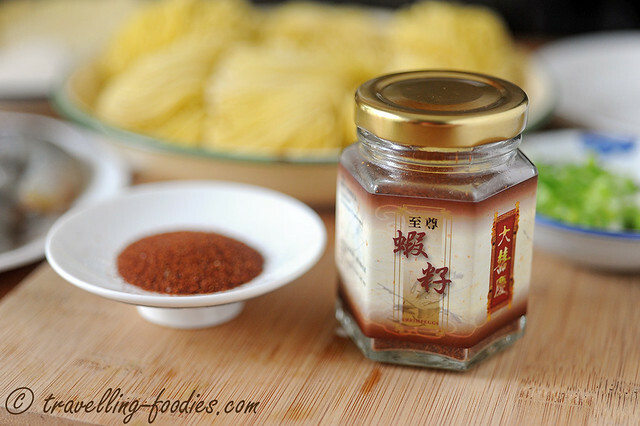 Albeit a little pricey, a small bottle goes a long way in heightening the palate sensation for enjoying noodles at home. Har zee is also heavily featured in another classic Cantonese dish, 虾籽柚皮 stewed pomelo rind with shrimp roe, while other modern interpretations include 虾籽炒饭 fried rice or 虾籽蒸蛋 steamed egg. Sorry to say, there is not substitute for the Cantonese shrimp roe. 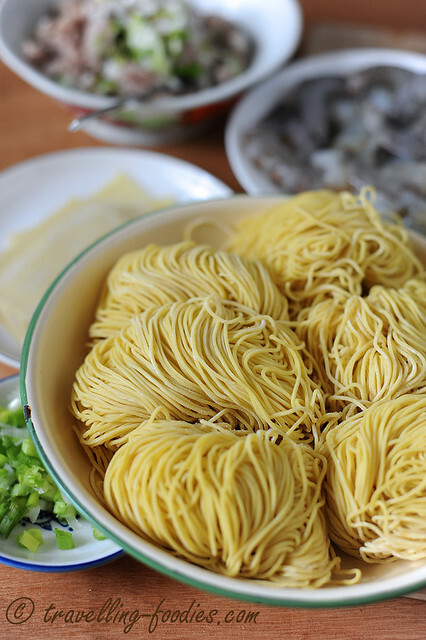 However, there are some dried noodles which already have 虾籽 incorporated into the strands. I’d not tried those before but they might just work. So do look out for these if you can’t find har zee from where you are. 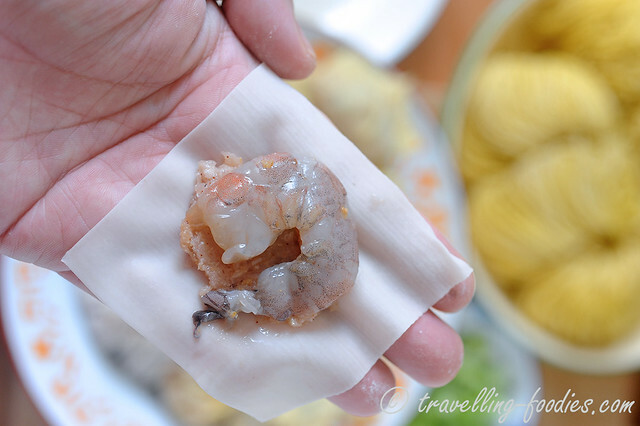 The method to wrap the wantan shrimp dumplings is quite straight forward but here is a quick pictorial guide. 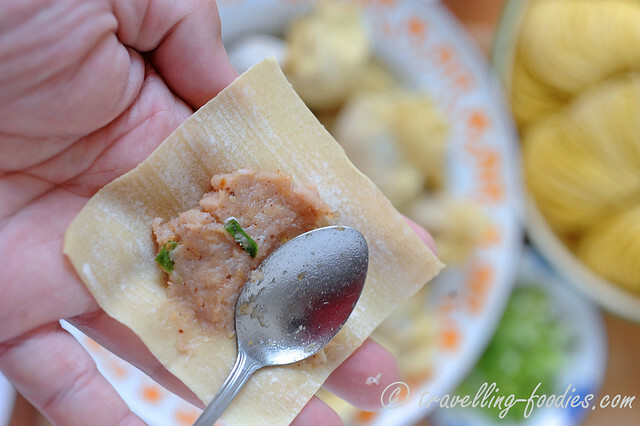 First, place a piece of dumpling skin on one hand and then a dollop of minced pork and shrimp filling on it. Use the back of a teaspoon to press the filling down onto the skin. The professional dimsum sifus and dumpling chefs use a short flatten bamboo baton for the task but there is no need for that at home. Next, bring two corners of the skin together to create a fold. It may help to dab the edges of the skin with some water or remnant egg white mixture from the shrimp marinade. This helps the skin to adhere better, to complete the seal. 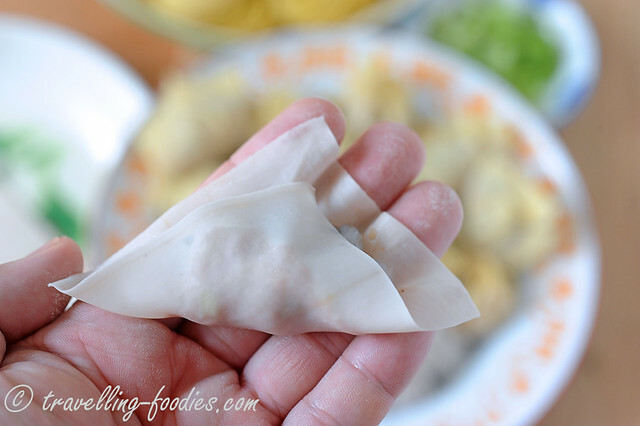 Finally, bring the other two ends towards the middle, gather the folds of the skin slightly and press gently but firmly to seal the dumpling. It is as simple as that! As usual, practice makes perfect so don’t be too worried if the skin breaks or the dumplings don’t turn out as pretty as those you had eaten in shops and restaurants before. What is important is the taste! Put all the minced pork and shrimp filling ingredients in a bowl and mix very well. Traditionally, the “glue” in the filling is worked up by repeatedly throwing the filling against the bowl, a technique known as ”甩浆” but for simplicity sake, cornstarch is used. Have a go at the traditional way if you are up for it though. Leave to marinate in the fridge for at least 30 min. Place all the whole shrimp filling ingredients in a small bowl and mix well. Leave to marinate for at least 30 min. Wrap the dumplings as described in the pictorial guide above. 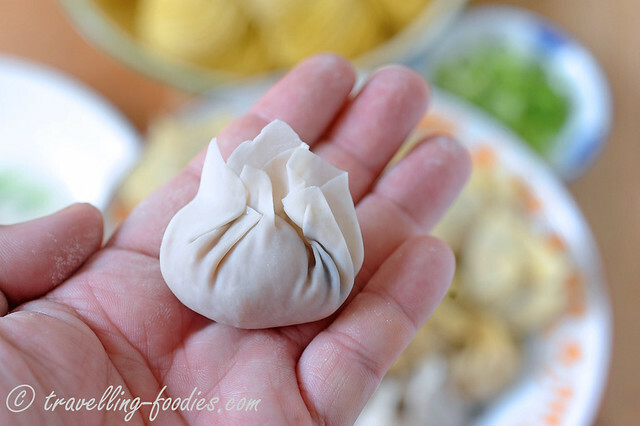 To cook the dumplings, simply slide them gently into a pot of water until they are cooked. Do not overcook or the skin may disintegrate. While the dumplings are poaching, cook the noodles. First bring a pot of water to a rolling boil. Loosen and separate the strands of noodles in each ball before placing the noodles into the boiling water. Cook the noodles for a bare 15-20 seconds until they are just cooked. Quickly blanch the noodles in a sieve under running water or in a basin of water at room temperature, a technique known as “过冷河” in noodle cooking. This process not only truncates the cooking but also prevents the strands from sticking to each other. Place the just cooked noodles in a plate and toss a tsp of lard oil or scallion oil. Sieve the cooked dumplings and place alongside the noodles together with some blanched green leafy vegetables. Drizzle some oyster sauce on the side if you prefer this. Sprinkle a generous portion of shrimp roe over the noodles and serve immediately. 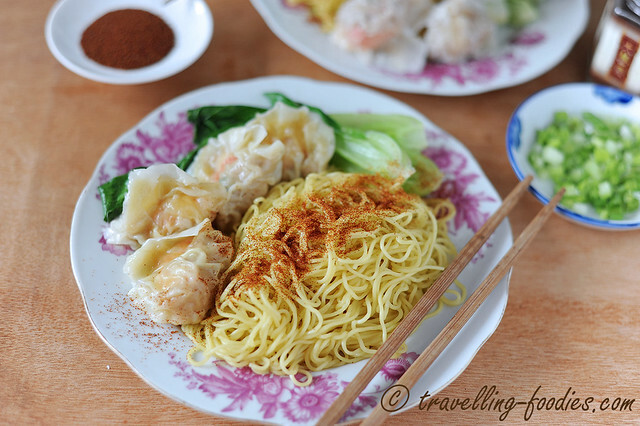 This entry was posted on April 30, 2015 by Alan (travellingfoodies). 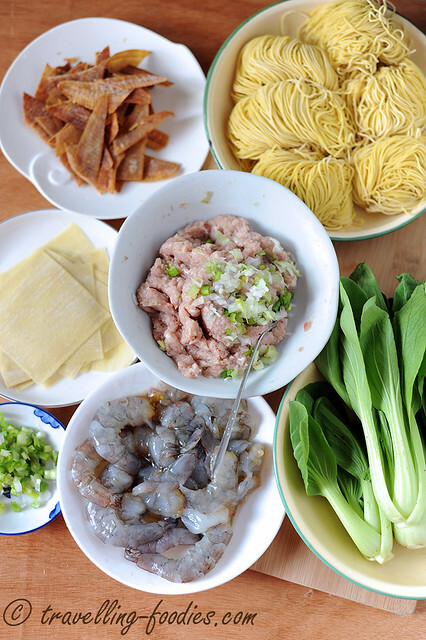 It was filed under Food, Simple Eats and was tagged with bamboo pressed noodles, cantonese, 竹昇麵, egg noodles, 虾籽, 鲜虾雲吞, Hong Kong, lye water, minced pork, prawn noodles, shrimp dumplings, shrimp roe, spring onions, springy noodles, wanton noodles, 捞麵, 港式. Wow! Your dumplings looks darn legit, Alan! I can absolutely imagine the texture and flavours of the dumpling coming together beautifully! Mouth-watering good!! Goodness, it looked so good you made me missed these noodles from HK. I really can’t get enough of them. I can have them everyday! First time I heard of Har Zee. Thanks for the introduction.